12 days in the Thai Islands [Itinerary] — Opium Teahouse. As the ferry slowed down and I stepped on the deck, I saw the shore is still miles away. As an answer to my quizzical face, the sound of a small gasoline motor announced the arrival of a ubiquitous long-tail boat. Fittingly, paradise did not come with a port. Our island itinerary was the leg of our 30-days in Thailand. It started from the remote southern island of Koh Ngai, a remote paradise island with white sands and a honeymoon atmosphere. From there, we went north to Koh Lanta, before stopping in Koh Phi Phi for a day, and ending the journey in the surprising town of Phuket. Beginning of high season. Resorts and hostels will start to get busy. Our island hopping started in Krabi airport, after a short flight from Chiang Mai. We stayed the night in Krabi town to catch a transfer to Koh Ngai in the morning. We visited Wat Kaew, a beautiful temple on a hill above the city, before stocking up on sunscreen. The transfer to Koh Ngai involved a minivan to Tran, a ferry and subsequently a longboat to the small island. We stayed at the environment-friendly CoCo Cottage. The hotel is comprised of several cottages with a honeymoon worthy ambience. The days consisted in sun soaking, snorkelling and watermelon juices. Eventually, we took a tour to the nearby islands to see the Emerald Cave, Koh Kradan and to snorkel in Koh Mook and Koh Cheaw. Koh Lanta, the second island on the itinerary, is considerably bigger but not insanely populated (yet!). It has a wholesome ambience to it: family resorts, beach Bootcamp and Scandinavian holiday homes. Renting a scooter is necessary to explore the island and reach the most secluded beaches. Kantiang Bay, Bamboo Bay and Nui Bay, in the South are the best and most deserted beaches. Our brief time in the Phi Phi Islands was in due to only wanting to visit Maya Bay. The island infamous party scene was clear from the moment we step out of the ferry in the morning. Not only that, the island is highly polluted and has not quite recovered from the 2004 Tsunami. Still, new tourists infrastructures are under construction in an already over populated isle. We booked, in advance, a sleep aboard tour of Maya Bay, which left Koh Phi Phi in the afternoon. With a pit stop for snorkelling and kayaking on Monkey Bay, we reached The Beach by sunset. After a campfire dinner, our group returned to the boat for a night snorkel amongst the bioluminescent plankton. Waking up at dawn to the first light, swayed by the gentle undulation of Maya Bay was one of the most relaxing sensations. After one last visit to the beach, we made our way back to Koh Phi Phi to catch the ferry to Phuket. Phuket was meant to be a relaxing stop before continuing onwards to Myanmar. We chose to stay in the Old Town in the wonderfully quaint Rommanee Classic Guesthouse, instead of the swanky resorts near the beach. Between exploring Old Town and checking the artsy coffee scene, we found Phuket so different from the rest of Thailand. A refreshing change of scenery! Decide where to stay before booking flights. The accommodation can inform you on the best way to get there, especially if the island is more remote. Travelling takes longer and is pricier than on the mainland. Activities like the Sleep Aboard sell out fast so book in advance. Luggage is tossed around ferries and longboats. Larger bags go to the bottom of the pile so take a carry-on! Weather in Koh Lanta and Koh Phi Phi has a couple of phases during the day. Morning and midday are sunny. The clouds roll in during the afternoon and culminate in a downpour just before sunset. 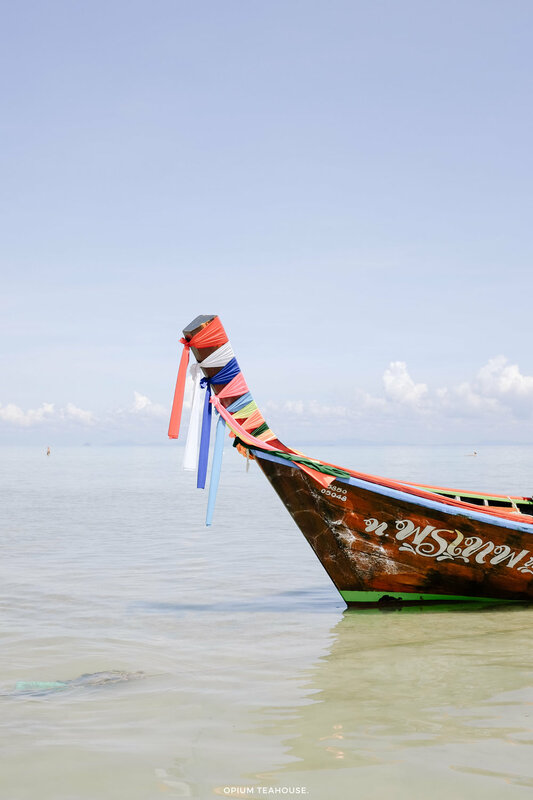 Check out our 30-Day Thailand Itinerary.